Pre Record Your Funeral Wishes. Heartfelt Funerals are able to meet with you in the comfort of your own home to discuss and record your wishes, whether you would prefer a contemporary, personalised service, or a traditional religious service with hymns and prayers. You have time to consider all your options. These may also change as the years pass and you are able to adjust these wishes at any time with us. The important thing is that family know where to find them and which funeral home you would like to take care of you. This may also change over the years and that is ok. There are no payments made to Heartfelt Funerals at this time. Although this can be an option for those who are close to passing away and the Family wish to put arrangements in place, rather than trying to make decisions as they grieve. Why pre-record your funeral wishes? Arranging your Funeral before the time comes allows you to record your wishes and concerns. This lets your Family know exactly what you want for your Funeral. It removes a great deal of the decision making burden from your Family. Remember, the service is about you, not for you. It is for those you are leaving behind. Where it will be held? At a crematorium, graveside, local hall or at Home. Who will officiate? Celebrant, Minister or a close friend or family member. Do you want to be buried or cremated? Many families have never had this discussion and may not be aware of your preference. What music would you like played? This stumps many families, especially if you are not a big music listener. On the other hand this can cause some heated discussions amongst siblings as they may have a different idea of what music you like. What flowers you would like? Favourite flower or colour or maybe none at all. You can then talk to Heartfelt Funerals to obtain detailed information about what options you have. From there, we can advise and assist you in your decision making, either as an individual or as a Family. Your choices can always be updated if you change your mind as the years pass. What can I do with My Celebration of Life? List your personal funeral preferences. Coffin type, having a funeral notice, orders of service, photo presentation, pallbearers, clothes you would like to wear or other things you may like that family are unaware of. This can prevent unwanted discussions at the time of arranging your service. Record your personal details. These will be required by Births, Deaths and Marriages when Heartfelt Funerals applies for your Death Certificate. If these details are not known, it may delay the application being submitted. Write your own newspaper notice. What newspapers you would prefer or none at all. You can have just a death notice or a full funeral notice or both. Choose photos. Photos displayed or for a life in pictures DVD to be played as well as photos for the orders of service booklets. You should keep this information with your personal papers and advise Family members and friends of its location. Heartfelt Funerals will also keep a copy of your wishes indefinitely for your peace of mind. You may review and update the information at any time over the years as things can change as time passes and circumstances change. Putting money aside for your funeral can eliminate the stress for those left behind giving you peace of mind. Unexpected funeral costs can add to the stress at an extremely emotional time. Funerals do cost money, and depending on the type of funeral you choose, this can come to a substantial amount. A Funeral Bond is an interest bearing ‘savings account’ specifically set aside for your Funeral. Unlike a Prepaid Plan, a Bond does not lock in the funeral prices. 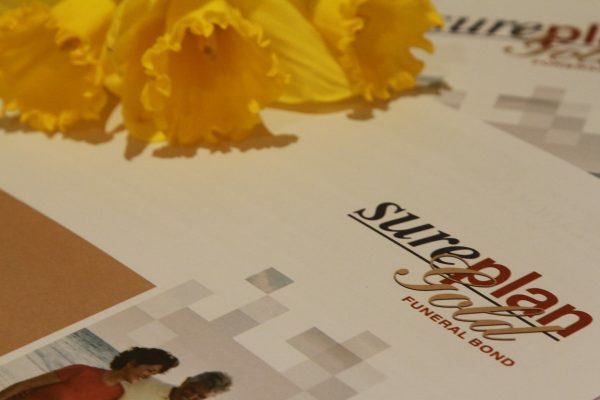 Heartfelt Funerals can arrange your Funeral Bond through Sureplan Friendly Society. They offer conservatively managed funeral bonds that are an ideal way to put aside funds for your funeral service expense. Customers are not locked into a contract to pay monthly premiums. You choose how much to pay, and are free to change your savings program at any time. Crucially, as you do not have to make compulsory payments (as with other funeral insurance plans and cover), you will not lose any money if you fall into arrears – the funds will always be there for your family. Once funds are lodged, they cannot be redeemed by anyone until the death of the individual named on the policy. A Funeral Bond will accrue interest which may offset the inevitable rises in funeral costs.